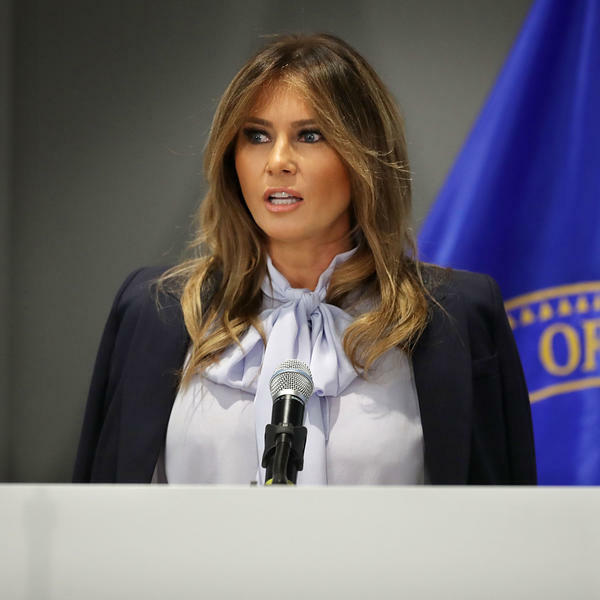 First lady Melania Trump delivers remarks during a Federal Partners in Bullying Prevention summit at the Health Resources and Service Administration Monday in Rockville, Md. "Let's face it: Most children are more aware of the benefits and pitfalls of social media than some adults," she said, "but we still need to do all we can to provide them with information and tools for successful and safe online habits." Social media is one of the issues the first lady is highlighting as part of her "Be Best" campaign focused on the well-being of children. Not far away, President Trump was himself online, sending a series of angry tweets in which he called one of his most vocal critics, former CIA Director John Brennan, a "political 'hack.' "
Brennan has repeatedly criticized the president, on Twitter and on television, prompting the White House to announce last week that the administration is pulling Brennan's security clearance. Trump has threatened to revoke the clearances of other critics, which prompted a scathing statement in response from a group of former intelligence officials. The anti-bullying event included a panel discussion with representatives from Google, Facebook, Twitter and the Family Online Safety Institute. As the first lady listened, the group discussed strategies to work with parents, teachers, government and the private sector to prevent online bullying. The roster of speakers also included a member of Trump's Cabinet, Health and Human Services Secretary Alex Azar. In her prepared remarks, Mrs. Trump told the audience that social media "can be used in many positive ways, but can also be destructive and harmful when used incorrectly." Earlier in the day, the president attacked special counsel Robert Mueller's team, which is investigating possible collusion between Russia and the Trump campaign. Asked about criticism the first lady has received for highlighting the issue of online bullying even as her husband routinely resorts to name-calling on social media, her communications director, Stephanie Grisham, said via text, "She's said before that she is aware of the criticism, but it won't deter her from doing what she thinks is right." Grisham also tweeted, "Rather than dissecting her remarks, let's focus on the countless children who struggle w bullying & online safety each day." It's not the first time Mrs. Trump has been asked about the issue; in March, she opened a cyberbullying forum at the White House by acknowledging the criticism. Nor is it the first time she has differed from her husband publicly. A White House official told NPR in June that Mrs. Trump had pressed her husband to end family separation under the administration's "zero tolerance" policy for illegal Southern border crossings. The first lady also made two trips to immigration facilities to meet with children detained as a result of the policy. The White House says the first lady will make her first major solo trip abroad in October — to Africa, a continent her husband has yet to visit. Grisham confirms that Mrs. Trump will visit several African countries and highlight humanitarian and development programs. This comes months after the president was widely criticized for reportedly making disparaging remarks about African countries. In every relationship, there are moments when two people seem out of sync. But today, the messages coming from the president and first lady could not be more different. While President Trump tweeted scathing attacks on his political enemies, his wife Melania was calling for more responsible social media use. She addressed a federal summit on preventing cyberbullying as part of her Be Best campaign. NPR's Sarah McCammon was there and has this report. SARAH MCCAMMON, BYLINE: Before an audience of public health officials and online safety advocates, Melania Trump said social media has become an inevitable part of kids' lives, for better or worse. MELANIA TRUMP: It can be used in many positive ways but can also be destructive and harmful when used incorrectly. MCCAMMON: Across town, President Trump was attacking his political enemies on Twitter. He called former CIA director John Brennan, one of his vocal critics, a political hack. Here's Trump last week after the White House announced Brennan's security clearance was being revoked. PRESIDENT DONALD TRUMP: I've never respected him. I've never had a lot of respect. MCCAMMON: This morning before the event, Trump used Twitter to call out special counsel Robert Mueller's team investigating Russian collusion as thugs. But Melania Trump said nothing about that. TRUMP: Let's face it. Most children are more aware of the benefits and pitfalls of social media than some adults. MCCAMMON: It's not the first time the Trumps have appeared to be working from different playbooks. After her husband again used social media to blast a critic, questioning the intelligence of LeBron James, the first lady issued a statement supportive of the NBA star's work with low-income children. A spokeswoman says she's aware of the criticism she's received for her focus on online bullying but, quote, "it won't deter her from doing what she thinks is right." Sarah McCammon, NPR News, the White House. Transcript provided by NPR, Copyright NPR.